Now, if Iraq truly paid the Iran in IQD, where else can the Iranian government use it beside Iraq? Iran exports goods to Iraq by the billions $ each year. But Iraq doesn't sale anything to Iran I know of. So, why would Iran accept to get paid in IQD? Except if they know that the IQD will be internationally accepted soon. Therefore, they can use it worldwide. Excuses, excuses, equal lies!!!!!! Maliki destroyed Iraq under his premiership; now, he's blaming the Jews. Because, a shiite is on top of the CBI, these people are beggers and procrastinators. Barham Saleh, the president, is the man. If we had some one like him in the CBI, this eagle would have landed long ago. He is a finisher! He is for the progress and success of all Iraqis. Israel doesn't play. Go Israel!!!!! Let's hope that is their last auction at that exchange rate. Since they had it the last day of 2018 at that rate for 1/2/2019 is still ok. Now, what happens starting this Wednesday will be a game changer. .... closed door meeting, watch what happens, and this guy always wins. Very interesting! what could it be? Mexico was going to pay for the wall. But, I want the RV. 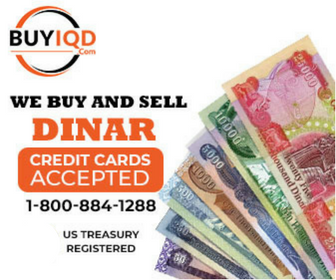 The Iraqi dinar is stronger than the Iranian currency. If Iraq pays Iran at the present value that would mean that they have no intention to revalue or that would be a tremendous transfer of wealth to their Shia neighbor. This goes without saying that they also have to remove the three lagging zeros from the rate in order to benefit iraq's economy. This is great news. And this is from someone in the know. Hope they implement it now not this infamous word "soon". Isn't it the USD fluctuating? And since the IQD is pegged to it it moved as well. There isn't anything exciting here yet. They are using more of other foreign currencies now and very little of USD, especially with Iran their biggest trade partner. That's all it's guys.